300 [Spartans]: Hollywood fact or fiction? 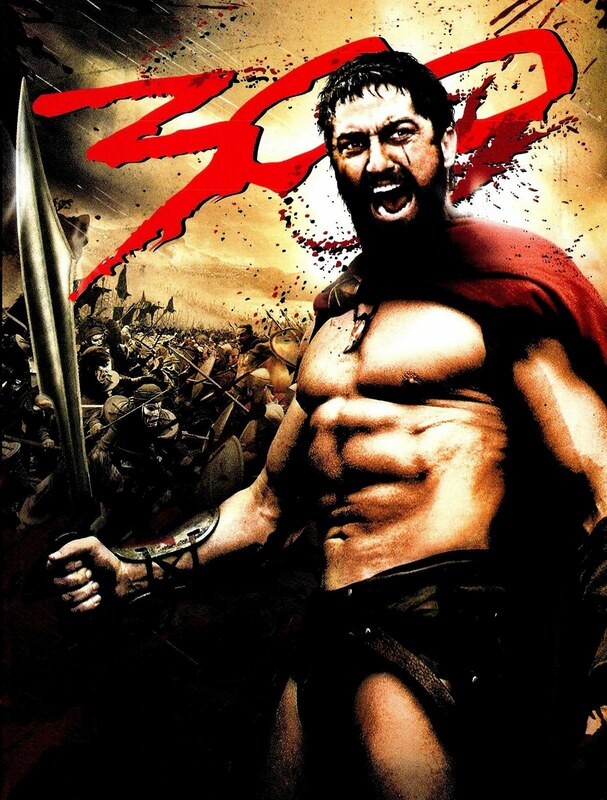 The 2014 film 300 relates to the tale of the 300 Spartans who fought and fell at the hands of the Persians. How much of the film was fiction? Well, the inclusion of the ‘monster rhino’ in the battle towards the end rather gave the answer to this question away! And the portrayal of Xerxes, the king of Persia, was a bit ‘punk rock’ to say the least. However, the film did have some truth in it – somewhere. 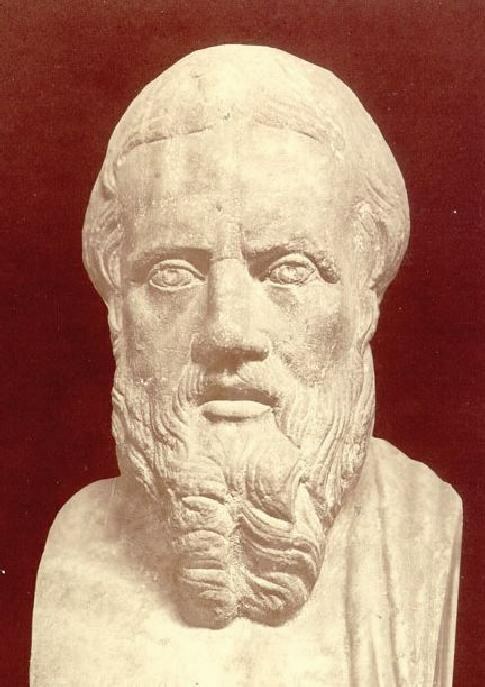 What ‘truth’ of the conflict we may know comes from the 5th century BC Greek historian, Herodotus and his Histories. The 300 Spartans (see also the rather less bloody-thirsty 1962 film version of that name) is about the Battle of Thermopylae (‘The Hot Gates’ in the film) which enjoyed a cameo role in the second Persian invasion of Greece in the 5th century BC. But that is not where it all began. The small island of Naxos in the Aegean is where it all began. During most of the 6th century BC (and before) Athens had been controlled by oligarchs – aristocratic families. Then around 510 BC, it became a democracy courtesy of a chap called Cleisthenes. The democratic rule spread among the colonies of Athens – except the island of Naxos. There the oligarchs hung onto power until they were finally thrown out by the democrats in 503 BC. And rightly so. That’s when the trouble started. The Naxos oligarchs headed in search of sympathy to fellow Ionians (Greeks) on Miletus (Myletus) on the east coast of Persia (now Turkey). This place was governed by Aristagoras who sought assistance for his beleaguered oligarchs from Artaphernes, the Persian satrap of Sardis. Artaphernes saw ‘£ or $ signs’ (actually darics) and control of Naxos ahead so he sent a Persian fleet to give Naxos a seeing-to. The Naxians were expecting the intrusion and defeated the Persian invaders. Aristagoras panicked as he thought Artaphernes would be severely vexed and take it out on him, so he called for Athenian help. Cleisthenes sent a force and took Sardis but, hearing of a large Persian army heading their way, the Athenians hastened home. This was the Ionian revolt of 500 BC and the remaining Ionian fleet was defeated by the Persians at Lade off the coast of Miletus (see map) in 495 BC. So ended the revolt. Darius I, king of Persia was none too pleased with the Athenian interference and so began the 1st Persian invasion in 490 BC . Now, looking at the map below, who do you think is going to be victorious? 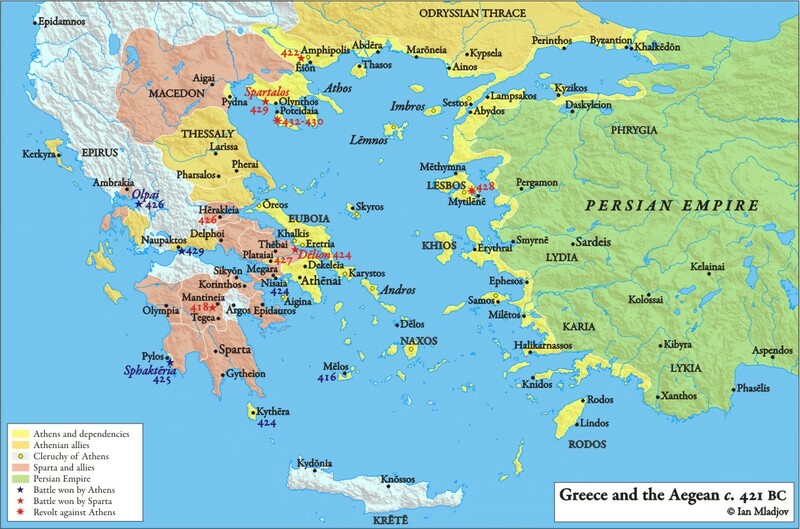 Darius’ force, under Artaphernes and Datis, first overpowered Naxos (well, it started it) then landed at Marathon, on the Greek mainland (see 1st map above) with about 600 hundred ships and some 30,000 soldiers (estimates vary). There were only around 9,000 Athenians and 1,000 Plataeans opposing this Persian force. This is where the marathon runner comes in. He, Phidippides (or Philippides), was sent to summon Spartan assistance . Unfortunately Sparta was otherwise engaged in a religious festival and declined the summons until the festival was over (in about 10 days). The battle could not wait that long but it is not entirely clear why the engagement then took place. The odds were certainly against the Greeks. Herodotus makes no mention of Persian cavalry, so one suggestion is that they (the cavalry) were embarking onto ships to sail around to attack an undefended Athens. The Athenian generals, Callimachus and Miltiades, took advantage and attacked the Persians whilst they were preoccupied with this manoeuvre. Whatever the strategies, the Athenians were victorious with only 192 losses (plus 11 Plataeans) to some 6,400 Persians. The Spartans turned up the next day! . 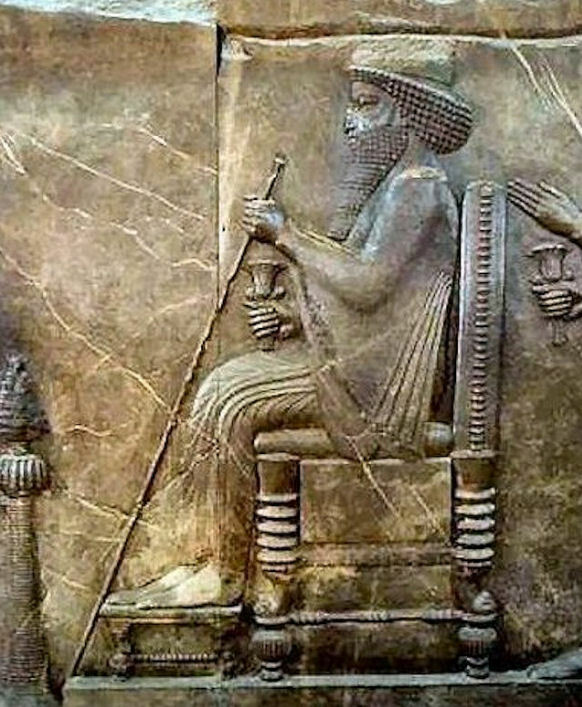 After Darius’ death, his son Xerxes decided that it was time the Greeks were punished for their audacity at Marathon. In 481 BC he set out with another vast army of possibly 150,000 men (we don’t know the exact figure), under Mardonius. In fact, there were two Persian forces – one travelling by land and one by sea. The latter sailed towards Athens and the former came around the mainland and crossed the Hellespont by way of a ‘bridge’ of ships – the first was destroyed by storm but Xerxes persevered and built another. Then the land force marched into Greece and headed for Thermopylae. At Thermopylae, in 480 BC, Xerxes came up against Leonidas, king of Sparta, along with 300 Spartans, 4,500 Peloponnesians, 1,000 Phocians and 1,000 Lacedacmonians. 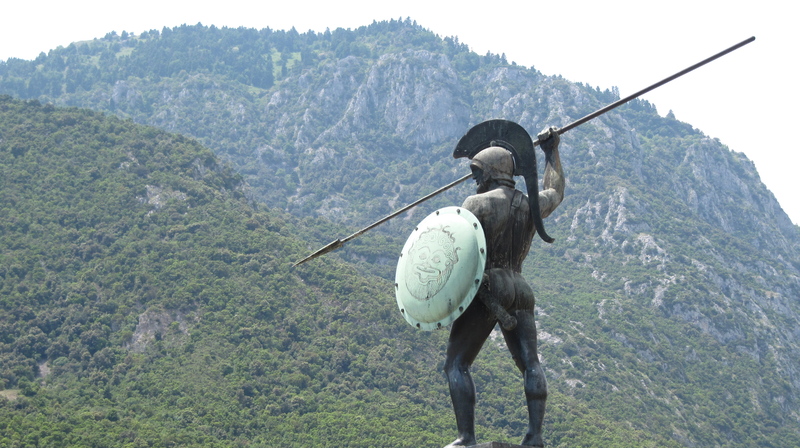 For several days Leonidas held the pass at Thermopyae to allow the remaining Greeks to gather forces to defend Athens. Eventually, a treacherous Malian, Ephilialtes, led 10,000 of Xerxes ‘immortals’ (his top soldiers – sort of ninjas in the film) around a goats’ path in the mountains and came up behind the Spartans. Leonidas had been aware of this track and had position the Phocians to defend it but they were surprisingly surprised by the Persians and fled. Great! (Leonidas had sent the other Greeks away by now realising his task was doomed and was just a delaying tactic). Leonidas and his fellow Spartans were all killed at Thermopylae (all except one, Aristodemus who let the field with an eye infectious – bless – but you knew that if you had seen the film ) and Xerxes marched into Attica and to Athens. Xerxes entered Athens unobstructed and burned the city to the ground. Believing the Athenians to be in a state of despondency he then attacked their fleet in the Salamis. To his surprise the Athenians were ready and waiting for him. Themistocles was able to keep the Athenian fleet together, engaging the enemy within a confined space, cancelling out the Persian superior number advantage (3:1 advantage over the Greeks – even though a large portion of the Persian fleet had been destroyed by storm on route to Athens – just not their day!). The Greek ships, although smaller in size were less crowded and more skilfully managed. This resulted in the defeat of the Persian fleet, watched by the anxious Xerxes. Retreating Persian ships collided with each other and those soldiers/sailors that managed to escape sought refuge on Psyttaleia, the only Persian occupied island in the vicinity. The Athenian, Aristides, was able to land on the island and disposed of these survivors. As with the previous invasion, Greek loses were small compared to the enormous loses from the Persian camp. A touch of deja vu for the Persians. The Persian land force under Mardonius was finally defeated at the battle of Plataea in Boeotia by the Greeks under Pausanias (not the Greek traveller – he was much later, in 2nd century AD). Plataea, although the major victory by the Greeks over the Persians, does not get the same press as Thermopylae as it does not conjure up the same heroic imagination as Leonidas and the 300 Spartans. Such is life ….. or death. 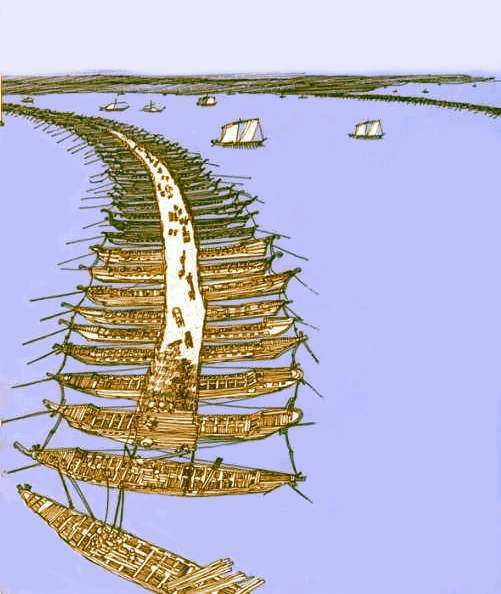 The remainder of the Persian fleet was destroyed at Mycale, in the eastern Aegean, rumoured (by Herodotus) to have taken place on the same day as the battle at Plataea. It was, in fact, a battle on land not sea, as the Persians, worried about their naval defeat at Salamis, beached their ships at Mycale and awaited the Greeks. The ensuing fight resulted in the total destruction of the Persian force, ending the Persian threat against the Grecian states …….. all because of Naxos. So all’s well that ends well …… if you were Greek. Under Pericles, Athens went on to build the Parthenon and associated buildings on the Acropolis as a result of Xerxes’ destruction of the city. This, of course, led on to another battle – that of the ‘Elgin’ Marbles (sorry Greek Marbles) which is yet undecided (see post in February). The actual marathon running race was introduced to the first modern Olympics Games in 1896. It gets its length of 26 miles (around 40 km) from the distance from Marathon to Athens – the other story is that the runner ran this route to announce the Athenian victory at Athens, then dropped dead. The distance from Marathon to Sparta is 150 miles (240 km) which is pushing it a bit even for an Olympic race, so the Marathon-Athens story is the link the Olympic ‘authorities’ stick to. Whilst visiting Athens in 1972, I dragged my parents and brother to the Marathon site. There is just a mound and a monument there. “We’ve all this way for this!” complained my brother. In fact, Herodotus tells us that two were sent away with eye infections but one, Eurytus, returned to the battle and his death.